The word liturgy comes from the Greek term meaning “public work or work done on behalf of the people”. For Catholics, we commonly interchange the words ‘liturgy’ and ‘Mass’, for indeed our worship or Mass, is not private but a communal celebration-a coming together or sharing of our love and praise of our God and from which, we go forth and share that same love in our everyday lives. 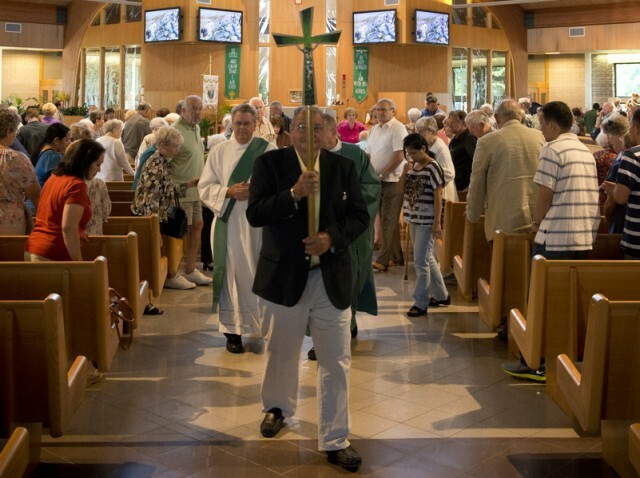 The Church celebrates liturgy using an abundance of signs, symbols and rituals. We celebrate with scriptural readings, homilies, music, processions, blessings, bread, wine, prayer, gestures of peace, bowed heads, kneeling, standing, sitting, incense, holy water, flowers, candles, altar linens, ritual vestments, singing, choirs, musical instruments, etc. Each of us, by virtue of our Baptism, have the right, obligation and we are expected to participate fully in the liturgy, for this is a holy “work” not entertainment or a spectator event. Some of us are called to assist the assembly in carrying out this holy “work”. These ministers serve a specific and integral function in our worship, but not more or less important role than each of us sitting in the pews. Cantor: Assists the assembly by leading them in song. Extraordinary Minister of Holy Communion: Can serve the People of God through three ministries: distributing Communion at Mass, bringing Communion to the Homebound, and bringing Communion to the area Nursing Homes and Assisted Living facilities. Altar Server: Assists the priest, leads processions, prepares the Altar for the Liturgy of the Eucharist. Usher: Greets and assists all parishioners and takes up the collection. Sacristan: Prepares and sets up all items necessary for the celebration of the Liturgy. Choir: Gives of their time and talent to assist the assembly with prayer through song. Musicians: Give of their time and talent to assist the assembly with their worship through music. Ministers of the Children’s Liturgy of the Word: Teams of four ministers who assist our children from ages 5-10, by proclaiming and breaking open the Word in an age appropriate way so as to foster greater understanding of God’s Word. Altar Linen/Altar Cloth/Vestment Care Ministers: Dedicated to cleaning, ironing and preparing all that we use in worship. Technology Ministers: Assist us in worship by running the worship aids on our monitors. Environment Ministers: Prepare the worship space for the various seasons as well as for weekly celebrations.